Historical drama “The Fortress” topped the Korean box office by a wide margin over the Chuseok holiday. The film amassed 424,409 viewers across the country Saturday, according to the Korean Film Council’s statistics, ranking first place daily for five consecutive days since Tuesday. The film directed by Hwang Dong-hyuk tells the story of the 1636 Chinese invasion of Joseon and stars Lee Byung-hun, Kim Yoon-seok and Park Hae-il. It has sold over 2.6 million tickets since its opening Tuesday. 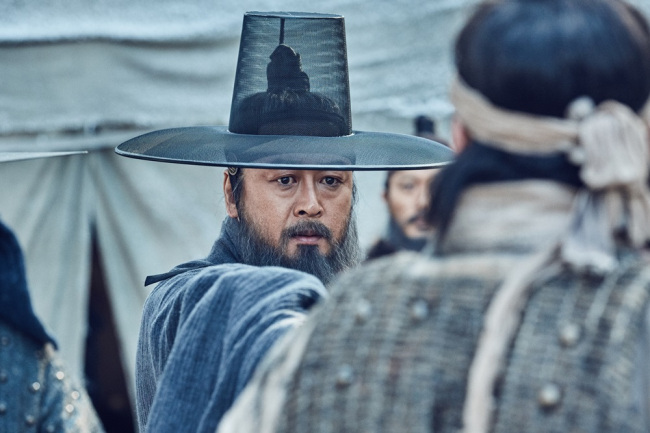 Ranking second on Saturday was “The Outlaws,” an action thriller directed by Kang Yoon-sung and starring Ma Dong-seok and Yoon Kye-sang, which sold 369,758 tickets. “Kingsman: The Golden Circle” came in third with 226,913 tickets. Matthew Vaughn’s “Kingsman,” starring Taron Egerton and Colin Firth, has sold over 4.1 million tickets since its opening in local theaters on Sept. 27. “Kingsman” surpassed the 4 million-viewer mark Friday, setting the record for attracting the most number of viewers in the shortest time among films rated for audiences over 19.